Back when I took copywriting clients, I had one request that seemed to come up over and over again. “I don’t want to do any marketing or selling,” the client would say. “I just really hate all that stuff. It makes me feel sleazy and gross and I don’t want my name associated with it and I don’t want to have anything to do with it. “But, um, I don’t want the business to die. You might think I laughed at this person and told him to enjoy being broke. But no. This, ladies and gentlemen, is why packaging is so important. If Don Draper had this client, he would have called him an idiot. But he still would have signed him for a fat account, and done some stellar work on it. Then he would have slept with his wife. Don Draper was in advertising before people got confused. He knew that persuasion always boils down to shockingly simple principles. If marketing makes you throw up in your mouth a little, quit doing it. Instead, just let your potential customers know who you are. Let them know how your thing will make their lives better. And tell them, very clearly and specifically, what to do next. About the Author: Sonia Simone is CMO of Copyblogger Media and founder of Remarkable Communication. Follow her on twitter and let her know just how much you hate marketing. That is what I love simplicity! I have to remind myself at times to not over complicate things. Some of us have been around and understand the terms and technology…some haven’t. Many people don’t understand that some of their readers may be totally new to the net and this all sounds like another language to them…. …and I am highly surprised by the people I know or have met that I thought were “super-techy” and must know everything there is to know about the Internet. SOOO many don’t know a thing about blogging. Or they have a business, but don’t know about twitter or Facebook. Anyway, thanks for making it easy! Brian must be taking a holiday break, as there is not Internet radio show today. Your message is simple and short today – yet it is very relevant. The master in the Karate Kid gave the newbie a simple task…wax car…paint fence…wax on, wax off. But it was the “wax on, wax off” that won the kid the contest – probably saved his life also. The radio show will be back first week of next year. Things are a bit slow around the holidays. Wil love to hear you guys again! Oh man what a brilliant post!! I am a firm believer in simple and am constantly striving for that with my clients and myself. Because I’m analytical, I tend to overcomplicate but I am trying to break my nature when it comes to the Message. Thanks again for posting. I wish it was simple as you describe in your post. I don’t know whether to laugh or whimper. That’s a great story. Also completely true. 🙂 I suspect I attracted that type of client because I was that type of client myself. Short. Sweet. Simple. When “marketing” gets coated in sugar like this, it makes it easier to digest. Wonderful post! Don’t just shyly suggest it… TELL them. Tell them as though you have 100% belief in your value (because you should). They still have the choice as to how to proceed but that little step of telling them will be the key influencer here. 1. I am Jax at ‘little grey bird’ online professional proofreading. 2. I will eliminate your spelling mistakes and improve your writing. 3. Contact me at http://www.littlegreybird.co.uk to discover what I can do for you. That’s all. But work on #2 a little so it says more about how the client’s life will be better after working with you. 🙂 You’re doing features, you need to nudge it over to benefits. I know that benefits often sell better than features. However, I’m not sure that you have to list explicit benefits every time. I think Jax says enough. If I needed a proof reader, and I probably do, I would consider Jax. I don’t need to be told the benefits of good copy. However, what does stop me is that I know nothing about Jax. Is he good, is he reasonably priced, do other people approve of his services, can I trust him. The above is a brilliant exchange. And, it just goes to show how easy it is to overlook benefits and underestimate their importance. Thank you Sonia 🙂 I’m considering attaching a pink ribbon to my forehead in my next mug shot and using that online from now on. Happy New Year! how to frame your business, right? This is an awesome yet simple post. Marketing and advertising is all about communication. Instead of trying to be a sleazy salesperson, you’re communicating with as many people as you can why they would want your product. Once they know that, it’s only natural that you would give them a way to buy it. I love this ethical sales approach. Communication is the key. That’s why my greatly-neglected personal blog is called Remarkable Communication and not Remarkble Marketing. When we get away from marketing being communication, things start to go a little haywire. I love this, Sonia! The basis of marketing is getting something “to market” — so a hundred years ago, if you were a farmer and had potatoes to sell, you had to get them to the village square — “to market” — so people could buy them. No one thought this was sleazy. In order for people to benefit from your thing, you have to make it available to them. That’s all marketing is. Putting it in non sleazy terms and calling it communication — which is exactly what it is — really helps to clarify and de-sleazify the whole shebang. I agree communication is what marketing is really about, or should be. Many of the job seekers I work with are told they need to “sell themselves” like they’re a bunch of hookers. I prefer to talk with them about communicating their strengths and benefits they can offer an employer – much less squeamish-y (how’s that for a word?). Excellent post, those are powerful tips! So it’s tell them who you are, tell them how you can help, tell them what to do, and….keep your sense of humor! I love how you “show, don’t tell” with these lines: But he still would have signed him for a fat account, and done some stellar work on it. Then he would have slept with his wife. Seriously, that’s the stuff good copy’s made of! Brava! Great post!! In marketing, we must keep the communication simple! Conversate with people as if you are speaking to them at your kitchen table! Nicely done, Sonia. Reading this succinct explanation was rather like looking at an M.C. Escher painting since the persuasive technique used therein followed your own advice. What is described here IS marketing. Developing relationships, determining needs and satisfying them are what marketing is. Relationship marketing has been around for awhile, it’s just online tools allow for much better segmentation and personalization. What is described here IS marketing. I let my customers know what just happened, what we delivered and what and when the next steps are. This goes after the job is complete, and it has dictated what my people buy. They are GRATEFUL that someone is selling them. My clients don’t have to worry about action steps. I started doing this 6 months ago, to benefit them. And they had more success with the sites and services, we do. Helping people actually take action vs. thinking about taking action is maybe the most important thing you can do for them. You bring up a great related point, which is that if people aren’t genuinely grateful for what you’ve sold them, you need to fix that part first. If you reiterate what they bought, and what they are doing, they become grateful. Meaning: sell them on how smart they were. htttp://flatratebiz.com/thank-you is the redirect link when someone buys. (Some links are neutered there). Constant reassurance. All the time. What Now/What Next. Great concept Chris, I love it. Sonia, never mind your client – I breathed a sigh of relief when you reframed marketing to communication. I can do the latter in spades while I’ve got a bit of a limiting belief about the former. Makes me think that good marketing is like being a regular, good human being. You *just* need to turn up, engage with folks and follow through. Hmmm… Simple, but not always easy indeed. Easier, perhaps, just to believe that I’m a crap marketer! Christine Livingston….as in Glenn Livingston’s wife? Sonia, the best clients I’ve ever had have allowed me to follow the formula you mention. And yes, it’s marketing, it’s advertising, it’s honest communication. This is what effective “Word of Mouth” is all about. No one will remember which store(s) offered 35% off when all of them shout the same message. And so no one will tell their friends because it isn’t worth talking about. But take a company like Tom’s Shoes, for example, that gives away a pair of shoes to someone who can’t afford them when you buy a pair for yourself, and there’s something worth talking to. Every business that I want to do business with or have as a client has their own unique story to tell, and while it’s not the traditional advertising that gets crammed down our throats, it is marketing and it works. Considering that marketing is communication…kind of a tricky post don’t you think? Gosh, that is so simple! Often we seem to over-complicate things making them more difficult than they really are. Your article puts things in perspective. Find out what our customers problem is and share the solution. I met a chiropractor last night and when I told him I was a marketing guy he practically rolled his eyes at me. But when we started talking about how he should communicate online through his site and fb and twitter and why its important he totally changed his tune and said to give him a call cuz he needs help. Almost every small biz feels ripped off by advertising and marketing types but to Sonia’s point if you can just show them it’s about connecting and clarifying and consistency, just being there in those spaces with a clear simple message, you will make $. This why I love your copyblogger stuff. It is so cool. The article is great and the art is not too shabby either. I have quit a few post that I don’t miss every day. I you and the copybogger folks are write up there with Seth “the man” So now I am thinking of change my handle to “Information Delivery Man”. FYI, I am making a short list of hot, must read blogs, for college Adv & Mktg students on my blog. I just reread my comments to you. Wow! so many typos. Please forgive. This is what happens when I write and send without reading stuff. typos of course. Thanks for the suggestion! This is exactly why viewing your marketing simply as business storytelling and content creation can be so powerful. It provides interesting and valuable content to your audience while you get to feel all warm and fuzzy because you’re not marketing in the traditional, skeevy sense. But damn funny. Thank you, Sonia, for a great laugh…and a great year of posts. That goes to all the Copyblogger crew too. Couldn’t imagine not knowing you guys. I don’t actually “know” the Copyblogger crew, but I couldn’t agree with you more Shane! And, I’m loving your Creative Copy Challenge. See you there soon! Thanks Marlee. That’s the beauty of the 3rd tribe approach; you may not personally know the Copyblogger crew, but they know how to make you feel as if you do. Great example of the power of structure. Some say structure is limiting. Not true. It’s like a little engine that you can dress up however suits you, and it still works. “. . . throw up in your mouth a little . . . ?” I think that line sets a new world’s record. It disgusted all 5 of my senses at once. Great post, and so very true in the world of social media. Tweeting valuable content is such a great way to get new followers, as opposed to being yet another person who Tweets self serving links. Great content rules! That is the best summary of what marketing is that I’ve ever read anywhere, beautifully written. I just recently discovered my love of marketing, and I’m delighted to finally be doing what I was born to do, but not all my friends understand it. When I explain it, I will send them to this post. It perfectly sums up my feelings about marketing. One thing I’ve noticed is how people almost universally scoff at marketing – and yet everyone uses it in some form or another, whether professionally or personally. It’s all spin – from what we wear to how we talk to what we put in our kids’ lunch boxes. Marketers simply stand up proudly and give it a name. I absolutely agree. Clients, especially new ones or prospects, rightly worry that they are buying into some “PR package” that will skew their message to the point they lose control of the message they want to impart. I know of a 22yo “PR guru” who cocked-up a free PR opportunity simply by being a control freak and giving her client wrong advice. Communication – B2B or B2C – should be fluid and tailored. Love this post, but will reiterate simple is not easy. In fact, it’s often more difficult! Sonia, I couldn’t agree more, and I’m glad that transparency on the web has forced many companies to put down their megaphones and self-aggrandizing marketing gimmicks and simply connect with one person at a time. We all started to believe that marketing was like peddling snake oil, and we forgot that people out there really want you to help them fix a very real problem. Of course, that’s not everybody. My point is that marketing isn’t inherently bad, and when it’s combined with empathy, humor, a true desire to help and serve, and a desire to view people as people and not “consumers,” both parties will walk away happy. No one likes a bully, but everybody appreciates a good listener who happens to also be an efficient problem solver. I used to work in a chainsaw shop and I sold a ton of Alaskan Sawmills because I used them myself and was very enthusiastic about them. It didn’t seem like selling at all because I was simply sharing my experience. Put in this framework, all I did was describe the benefits I received from using this tool and put their money in the cash register. Nowadays, its all about market research and niches and it often happens that we wind up in a market we aren’t even interested in, simply because the numbers say its where we should be. Then we wonder why we have a rough time selling! Connotations of “marketing” today usually includes annoying telemarketers, spam mail, etc. Obviously these are part of marketing, but marketing isn’t all about these. This post is a great reminder that marketing is really just one form of communication. Great post! A good read for all marketers (both pros and aspiring ones). So glad I found you guys. Great post on K.I.S.S. After writing about 356 post this year, I can’t help but say, “why didn’t I find you earlier..ahhh”, but I’m gald to know you now. I’ve read through the Keywords, internet marketing and Headline writing in one day. Wow, that’s good stuff. Just wanted to give you kudos. If you stay in your comfort zone, guess what happens? You keep doing what you always did so you’ll get the same results you always got! Sure it’s uncomfortable, but the world belongs to the bold. You feel the fear, but grow some balls and do the seemingly intimidating stuff anyway. Key insight about marketing versus popularity: if you want to live off of your blog, then remember that you’re not here to win a popularity contest. You’re here to make (enough) money while talking about your greatest passion. What’s the use in 5000 visits a month if 0,1% buys? It’s better to have 500 visits where 1% buys. Sorry, went on a rant there, but my point is: you DO need to know some basic marketing, like which key performance indicators to use. Example: If you want to live off of x amount of dollars a month, I need to sell x amount of products, since my conversion rate from visitor to customer is XYZ I either need to improve conversion by this much or increase the number of visits by that much to be able to live off of this blogging gig. Hmmm. been thinking about the power of a blog. By telling everyone about our product – well even Oprah has told the world about Australia recently – it seems to be a topic that is ‘yeah, yeah.’ I was thinking about blogging about amazing Burleigh Heads people and businesses from a tourism point of view. I think this is kind of telling it as it is and letting people know what we have to offer from a very personal perspective. Do you think this would have street cred? wow, simple but very good advice! like it! 1.”Instead, just let your potential customers know who you are. 2. Let them know how your thing will make their lives better. We are a sophistacated society and as such people want to feel that who they are is validated, understood and heard. In doing so trust can be established. Solving problems that are clear and specific to individual needs honors people. Telling stories with empathy and compassion opens a whole new world. Keeping focus, especially now, not so easy. But it can be done, and I see great examples all the time. I have been in sales and marketing for over thirty years and it still amazes me that business people think they can success WITHOUT selling or marketing. Everyone sells and markets … some of us just do it better than others. And yes, finding someone who does it better than you do it is FAR better than chucking sales and marketing altogether. Simplicity, as you so eloquently point out, is the name of the game. Very true. I particularly love the assertion “it sells itself.” Uh, probably not. 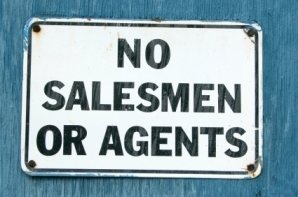 Yes I agree you don’t need to be a salesman when you blog. In fact if you come across to salesmany people will stop reading your blog and not come back. It is better to just present info and then have a simple short call to action at the end of each post. Very intrtesting article, However, I would have to disagree with you on varoous levels. For example marketing and selling go hand in hand. If you are offering a proudct or a service, then you have to market them. Without marketing you are not going to get anywhere. If you are Copyblogger, then you dont need marketing as you are already well known, again if you want to reach a new audience, then you need to market your product. I use to have a hard time selling my products and services when I first entered into the sales arena. But after a few years I developed a soft sell approach. This is how I got over my reluctance to market my product or service to new customers. I also found it to be the best method of generating long term relationships with new customers. From my experience, a lot of consumers shy away from the hard sell as if they are conditioned to avoid it like the plague. But the same customers seek out people who are genuine. I think there is a place for the hard sell and the soft sell. It really boils down to your personality, product and whom your target market is. Whats most important is that you figure out what works best for you and improve on it.